Thinking about Megatron the other day led me to thinking about Reverse Convoy/Reverse Megatron from the Robot Masters toy line. As I've said before I quite liked the Robot Masters toy line. Sure it had more than it's share of critics (take a shot), but I really liked it (take another shot). When Reverse Convoy was revealed on news sites, it was met with mixed response (you probably shouldn't take another shot, it's a weeknight). 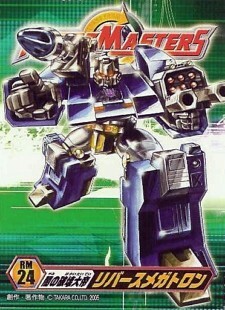 Many praised the use of the fan favorite Hero Megatron mold and the inventive head swapping gimmick. Though many criticized that same head swapping gimmick as the Megatron head was far from perfect and several didn't like the colors. I recall even hearing complaints about the reuse of the mold (ask for water and then complain about getting water... I swear some people...). No surprise, I liked it. It's a mold I'll never get tired of and with this revision of it, they improved the one thing I never liked. They took away the air pump. It was part of the original toys play gimmick that I always just felt like was in the way. Just a box hanging off the toy that could be stored, but still left the hose in just the right position to assure any slight bump would remove said box from it's storage place and now it was gone. Utilizing the tanks cannon, the head swap gimmick would allow for a quick transformation from Reverse Convoy to Reverse Megatron. Basically Reverse Convoys head would stow away inside the tank kibble as it would during normal transformation, and Reverse Megatron's head would rotate around from the back of the tank's cannon, which of course was mounted on his shoulder. The Megatron head was far from perfect admittedly, due to the back plate of the head fitting into the tank cannon, it was a bit awkward looking. Not to mention, those round things that are often depicted on the side of Megatrons helmet (what are those anyway) looked like hair rollers to some people. I didn't share that opinion, but there was no doubt that the head could have been better. Though the Reverse Convoy head I thought looked sharp. The colors? Once again, I thought they looked good. I do say they could have used something extra, just to give it a little more pizazz. As is, the colors make me think of Machine Wars Megatron. Whom for all purposes could have been the last appearance of Megatron in this timeline. Not the exact shade, but pretty similar. History hasn't been kind to Robot Masters as many people have either forgotten it or never were aware of it despite regular bootlegs of the toys at your local discount stores. That's a shame, or at least to me as I thought it was great.